If you have ever been surrounded by meals prepared by chefs, good and not so good, who consider themselves artists and very special and you have become a bit jaded and hanker for some good old French country restaurant cooking the way it used to be, this is the restaurant for you - La Ponche. Part of the five star hotel La Ponche, it offers both traditional dishes, regional dishes and Mediterranean dishes with an emphasis on fresh caught sea food, some with a modern twist but all real food that is not fussy and that tastes great - day after day. Restaurant "La Ponche" has a menu that offers both regional dishes and more modern choices as well, and some traditional with a more modern twist. 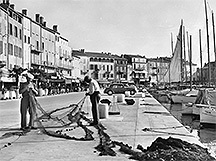 Many are typical St. Tropez dishes and many are drawn from around the Mediterranean. 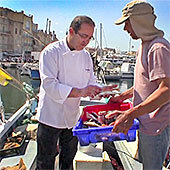 This is down home sea-side food filled with the tastes of the Mediterranean and of Provence. The inside dining room is small, cozy and just as charming as the rest of the hotel with a window that looks out over the bay. But unless the weather is awful, the covered patio dining area that has served drinks and there meals for decades is a lovely environment to enjoy the food from Executive Chef Christian Geay who specializes in sea food, which should come as no surprise. (See our "Join us for Lunch & Dinner" video as well as a video of chef Geay going over the daily catch with fishing family Raggio.) If you pick a table close to the open front, you have a great perch to people watch between courses since the little square in front is also the passage way from the harbor side of town to the beach and Citadel side of town. And from here you can watch the sun rise in the morning and the light set out over the bay in the evening accompanied by the light sound of waves breaking on the beach below. The food is simply prepared with the freshest of fresh produce. As chef Geay says "my cooking is simple, made from good, fresh products. . . It is in harmony with the restaurant setting: simple and authentic." The dishes are delicious, unpretentious and filling - the way most French food used to be. 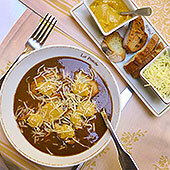 The restaurant is famous for its rich and aromatic "Soupe de Poissons" or fish stew, which is indeed outstanding. Fisher family Raggio fish the rocky shore line every day in their family boat "Deux Frères" and bring back the catch just for this dish. Chef Geay's fresh sardines marinated in lemon and olive oil are also a delight and served cold are a great hot weather dish. (See the recipe preparation video). As well as the Soupe de Poissons, there is a Salade Nicoise, a Caesar Salad (not French but it could have been), Oysters, Foie Gras (distinctly not Mediterranean), Tomato and Mozzarella (distinctly Italian) and more. For main courses, there is a variety of red meats from Charolais beef to Black Angus, Rack of Lamb to Veal and Provençale Beef Stew known as "Daube". But Restaurant la Ponche is practically sitting in the sea, so it is more obvious to take advantage of the products of the sea like Monkfish Bouillabaisse, Fillet of Red Mullet with spaghetti and Pesto, or Bouchot of Mussels, Blue Lobster tagliatelle pasta or Roasted Scallops on courgettes. But our favorite were the wild caught fish simply grilled or in a meunière style, or Sea Bass cooked in a salt crust served with simple market fresh vegetables on the side. Delicious and do not leave you hungry afterwards. There is also a set "Menu de Provence" where you can order 3 courses for 35 Euros or at lunch you can just order 2 courses for 28 Euros (circa 2015). Deserts offer a wide selection but my lunch dessert of fresh fruit salad in a tulip biscuit bowl outshone Peter's tulip glass confection of ice cream, rum flavored berry jam and loads of whipped cream. We are aching to try more of the offerings once we work off these. So many restaurants we try every year have just a few offering that really attract us. But La Ponche is more like a family restaurant with a wide selection to draw you meal after meal. 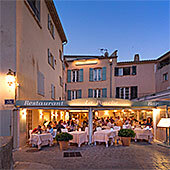 So this restaurant is wonderful for a meal while on the road, wandering the back streets of St. Tropez or, even better, a place to eat all your meals for a longer stay at Hotel La Ponche. And the personal attention you receive as a guest includes catering to your personal tastes whether for your room or for your stomach. So you can design your own variation of the dishes on the menu or simply ask if they would prepare you something you especially want and if they can and have the ingredients, they will do their best to oblige. We interviews a gentleman from New York City who has been coming for the last 20 years and would not miss it.